Buried at Deansgrange,Blackrock, Co. Dublin the largest cemetery in south Co. Dublin Major Alexander Hewetson (44), Royal Field Artillery, was killed while flying on Salisbury Plain on 17th July 1913. At Winterbourne Stoke is a Celtic Cross erected to the memory of Major A. W. Hewetson, who was killed whilst flying on the 17th July 1913, when he crashed in a Bristol Prier-Dickson monoplane during the test for his aviator's certificate. REPORT ON THE FATAL ACCIDENT TO MAJOR ALEXANDER WILLIAM HEWETSON, WHEN FLYING AT LARKHILL, SALISBURY PLAIN, ON THURSDAY, JULY 17TH, 1913, AT ABOUT 6.20 A.M. The Committee having carefully investigated the fatal accident to Major A. W. Hewetson whilst flying a Bristol monoplane at Larkhill, Salisbury Plain, on Thursday, July 17th, 1913, has come to the conclusion that it, the accident, was due to lack of skill on the part of the pilot. Major Hewetson had been a pupil at the Bristol School for about two months, and during this flight, which he was making in order to qualify for the Aviator's Certificate, he over banked the aircraft at about 100 feet on a left-hand turn, and this was followed by a nose-dive to the ground. It is possible that owing to his overbank, the pilot slipped transversely on the double seat, of which he occupied the right-hand side, and thus lost any chance he might have otherwise had of righting the aircraft. The pilot was thrown clear of the aircraft and was killed instantaneously. The aircraft, after striking the ground, caught fire. The wind at the time of the accident was steady and not more than five miles per hour. 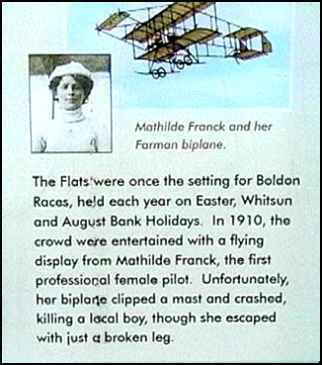 His widow, Mathilde Franck, had also been an aviator, doing aerobatics, a career that ended as abruptly as the life of the small child whom she hit when she crashed in 1910. 1. Take and post a selfie with the Celtic cross.